Scientific- Education, Laboratories Equipment, & Furniture, & Experiments. RB with its international partners operates on the international market complying with the educational programs of the various countries. At this purpose, flexible Systems are proposed to ensure the compliance with Current technologies and Industrial market. The educational equipment provided by RB partners covers most technological fields such as the Scientific-Educational & Health. Facility of Science College: (Chemistry, Physics, Biology, Geology). Facility of Health Science College:(Medicine, Pharmacy, Applied Medical). Hospital laboratories: (Chemistry, Microbiology, Histopathology). Laboratory furniture: Steel or Wood, Trespa vs Epoxy with all accessories we can supply it from Europe with a perfect installation. Medical Furniture (Trollies, Cabinets, Shelves, and many others). RB has over the years worked with major telecom & Scientific equipment vendors and system integrators to meet the testing requirements arising at various stages of both of telecommunications & Scientific product development life-cycle. With its proven expertise of over 19th years, RB has a comprehensive suite of telecom testing solutions to verify and ensure 'quality and reliability' of a variety of telecom networks including Wireless, and high-speed fiber optic lines, & Scientific equipment. 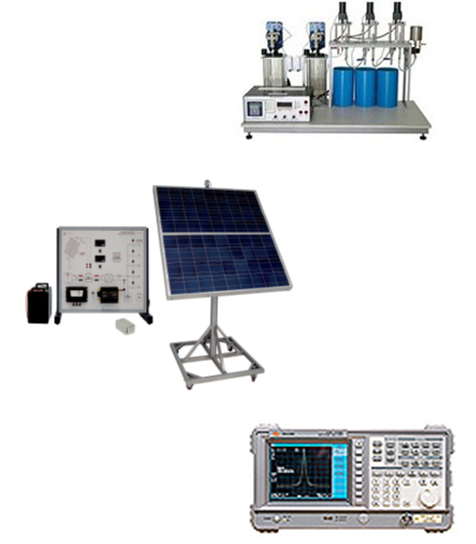 Devices and test solution for fiber system characterization – lightwave system – radar and microwave application : - Fiber test : A- Field & Portable Network Testing: OPM-OPL-Fiber inspection - OTDR- OSA B- Monitoring solution: FTTx – Broadband –network,. Microscopes – Spectrophotometer –PH Meter – conductivity meter. Industrial failed : Hardness tester, Leak detector. Communications and Networks (CN) Lab Microwave, Antenna, and Radar Systems (MARS) Lab, CNC& CMM & Router labs. The Educational labs provided by RB-TECH partners covers most of the technological fields such as : Electronics and Electrical Engineering, Telecommunications, Mechanical, Mechatronics, Chemical Engineering, industrial, Renewable Energies, Physics, Chemistry, Biology and many others,…. The primary objective of RB Tech is to become the leading proponent in telecommunication in the Middle East by understanding our client’s needs and expectations. To provide solutions, products and services that is consistently exceeds those expectations. The know‐how and professional tools. Achieve the goals professionally within the shortest time frame. listen to clients needs to exceed expectations. Establish and maintain high standard on work environment. Follow us on social media to stay updated with our latest news.